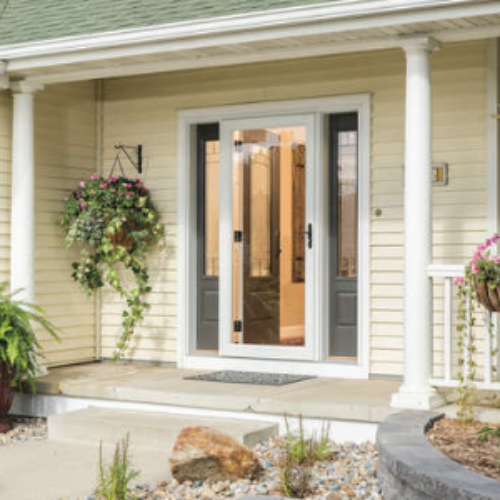 You can enter the New Door Giveaway from Bob Vila for your chance to win one of two new $500 premium storm doors crafted by Larson Manufacturing. If you win you’ll add ventilation, insulation, security, and curb appeal with a top-rated Larson storm door. The winner gets to choose either a Premium Storm Door with Hidden Closer or a ScreenAway Medium Pet Door with a PetSafe pet flap. Entry ends April 08, 2019. Here’s another great giveaway from Bob Vila for a smart way to improve your homes value and appeal. I feel like in the world of home improvement, everyone thinks about kitchens, bathrooms, and yards but doors don’t get much attention. Your front door especially can make a significant difference in the curb-appeal of your abode, because like you always hear, you don’t get a second chance to make a first impression. These doors from Larson Manufacturing are America’s best selling storm doors. Their innovative hidden closer is built into the storm door and out of sight to enhance the inside-out view. They also feature their Click & Hold innovation that keeps the door open with an audible catch and release and holds it open securely until it’s pulled shut. The doors are made with a maintenance free aluminum frame and edge seals that keep the weather on the outside. My house has a couple of interesting doors from yesteryear. The front door has three long-thin glass filled cutouts that quite frankly serve no more purpose than to fog up constantly, reducing my view while increasing my need to clean them daily. My back door, on the other hand, is really something to behold. It has a large cutout that runs the majority of the size of the door and has jalousie windows, which for you non-Floridians, are the slats of glass that you crank with a handle. While I’m sure it was quite stylish when it was installed in the 1970’s, an era when energy conservation was apparently the least of anyone’s consideration, it’s now not only outdated but a gaping leak of warm or cold air, depending on the season. And the real fun begin’s when that little crank fails, which as anyone who’s owned jalousie windows knows, it’s not a question of if, but the assertion of when, the crank will malfunction. To top if all off, at some point someone must have wanted to increase the virtually non-existent security of the door and added some bars over the outside. Needless to say, I’d love to replace it. As always I’m sending all the luck in the world to one of my subscribers or fans to be one of the two winners of these Larson Doors from Bob Villa. Let me know in the comments below if you have some kind of older or non-traditional door, I’d love to hear about it.